It's 9:30 am and things are underway to start another busy weekend. I have a meat-lovers pasta sauce cooking on the stove. My youngest wants lasagne for his birthday dinner coming up in a couple weeks so I am getting a head start. He also wants a white chocolate and key lime mousse cake (Paula Deen's) . So today I'll make a meat lasagne, later I'll make a vegetarian. My older son was sick for a couple days so stayed home from school. He had a fever of 101. So yesterday I ended up doing some housework and making banana muffins. I may have mentioned before, I have a banana intolerance so it is the only muffin I make from a box. Of course, I bump up the nutrition by adding extra banana, ground flaxseeds and oat bran. Now, while the sauce is simmering, am just catching up on the laundry - the job that never ends. My boys are staying for lunch, so will probably do some errands this afternoon. Spring fever has hit the prairie as some above average temps forecast for the weekend. We are planning to drive up to the cottage, just to see how it wintered. In the morning Danny was invited to the finals in a Knights of Columbus free throw competition. We will end up having lunch in the car, what we call a car picnic. I think I'll assemble that today. We have a very quick turnaround between basketball and road trip. I am addicted to food documentaries. It's true. I've seen HBO's Weight of the Nation, Fed Up, The Skinny on Obesity, Food Inc, Sick Fat and Nearly Dead, Supersize Me, Food Matters and countless others. The one that shook me up was Vegecated on Netflix. Be warned - not for the faint of heart. One of the first things I did was look of recipes similar to what I was already making. Cookbooks, Pinterest and a call out on social media gave me a place to start. The next thing was to arm my pantry and freezer . I made vegetable stock, cooked/ froze beans and cooked, puréed and froze sweet potatoes. I also started to integrate almond milk into our diets. As a life long carnivore, the concept of vegetarianism seemed foreign. The more health experts you listen to, and the more information I gather, the more I believe that the healthier way to eat is through a Whole Food Plant Based diet. I think if I never cooked meat again my family would be in an uproar. So for now, we will continue the meatless Monday to Friday and save the steaks and burgers for the weekends. Today I brought out the slow cooker to make a Corn and Black Bean Soup; a variation of a recipe given to me by my friend Andrea and one I found on Pinterest by theveganchef.com. Cook on the slow cooker 6-8 hours on low. Finish with the juice and zest of a lime and chopped fresh cilantro. Now that Halloween is over its time to finish with that jack o'lantern that has been waiting on the front step. First of all DON'T leave it outside all night. When the trick or treaters have all gone home, put it in your fridge until you are ready. Cut into big chunks, and place on a foil tuned baking sheet. Drizzle with a little oil and place in a 300f oven. This could take a couple hours depending on the size of your chunks. Check if pumpkin is cooked by pricking with a fork. Remove from the oven allow to cool. Peel off skin and place in a food processor. Process until smooth. Transfer pureed pumpkin to the fridge or freezer. This can be used for any number of pumpkin dishes. Now that I have muffins fresh pumpkin puree, it's time for muffins. 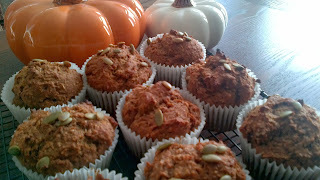 Today, I am making an almost 'clean' pumpkin spice muffin. Those that are following clean eating principles will enjoy these. There is no refined sugar or flour and has an extra boost with ground flaxseeds and chia seeds. Mix wet ingredients into the dry ingredients until just combined. Don't over mix. Divide into 12 muffin tins. Sprinkle with pumpkin seeds (pepitas) if desired. Bake at 325 for about 20 minutes. So there you go, a guilt free muffin you can enjoy anytime. It's been an interesting summer and things are feeling like back to school time. We've had lots of time at the cottage and my foot has recovered from surgery. Last weekend we attended the Winnipeg 2nd annual Blues and Barbecue festival where I was selected to compete in the Turkey Chili Throwdown. Out of all the entries, 3 were selected. The chilies were prepared by chefs from Granny's Turkey and we're tasted and voted on by attendees of the festival. After 2 hours of tasting the votes were tallied; the winners were announced and my chili came in second place! I was (and am) very excited. So not only is this recipe easy and delicious but it follows the principles of "Clean Eating". It has three superfoods (sweet potato, kale and flax seeds), uses a small amount of healthy oil and no added salt. This can also be made in a slow cooker. So, as I promised to my Facebook friends, here is the recipe. In a large pot, heat the oil and add onion and garlic. When the onions are sweating, add the ground turkey. Allow to brown breaking apart with the spatula and add flax seeds. Add remaining ingredients and allow to simmer at least 30 minutes. Top with sour cream and fresh cilantro if desired. It's been 3 weeks since my surgery. I'm supposed to stay off my feet but cabin fever has set in big time. My garden has been ignored for the most part, but the perennials are doing their job. My youngest son has a friend over to play and I find myself with a craving for something sweet. I remember these homemade skor bars one of the choir moms made for a Christmas party.... Perfect. They are simple, quick and delicious. It makes a big batch so I can send some home with Jack's friend. I might even make some for a little thank you gift for the crossing guards at the school. Line a baking sheet with tin foil and spray with nonstick spray. Line crackers in a single layer getting them as close together as possible. In a saucepan, melt butter. Add brown sugar, corn syrup and vanilla. Bring to a boil and simmer until it starts to thicken...about 8 minutes. Pour sugar mixture over prepared tray and spread evenly with an pallet knife. Place in the oven for 8 - 10 minutes. Remove from the oven and let sit for just a minute until it stops bubbling. Sprinkle chocolate chips on top. Place in the oven for just a few seconds to start the chocolate melting. Spread evenly with a pallet knife. Cool to room temperature and break into pieces. 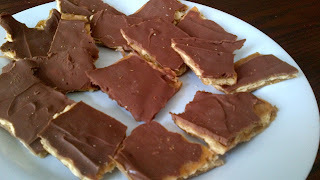 As a option sprinkle melted chocolate with nuts or toffee bits. My husband had a special request for dinner. It wasn't steak, nor was it pizza. It was a diner staple... A patty melt. Before then, I have never even eaten a patty melt but now I am hooked. It was so easy, and had rave reviews from the whole family. With a little prep during the day or the night before, you can use this diner classic on your busiest night of the week. This is one of those meals that you don't need a recipe to make it. Just a few of your favorite toppings. You can use whatever leftovers you want. My husband likes caramelized onions and pickled jalapeño peppers. I like sautéed mushrooms and bell peppers. Add a little barbecue sauce or hot sauce or pesto and a cheese of your choice. I find shredding the cheese helps it melt easier, and it uses less cheese to save a few calories. All you do now is place your filling between two pieces of bread, buttered on the outside and cook like you would a grilled cheese sandwich. I like to use my panini maker. How great would this be on the night where everyone is home for dinner at different times? How about on soccer practice night when you have 30 minutes to get out the door? What I really like about this meal is the versatility. How about a chicken burger with tomato sauce and mozzarella for a Chicken Parmesan melt, or with a slice of ham and swiss cheese for a Chicken Cordon Bleu melt? Turkey burger with bacon, tomato and white cheddar for a BLT melt? 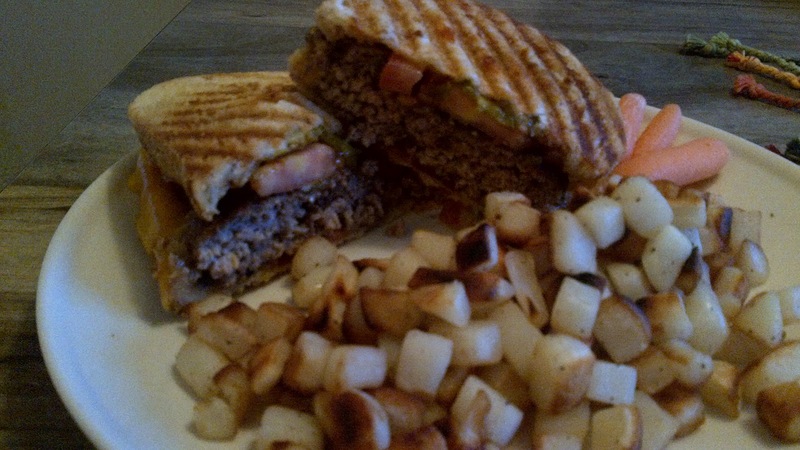 Beef burger with sautéed peppers and onions and provolone cheese for a philly cheesesteak melt? Turkey burger cranberry sauce and brie? The possibilities roll around in my mind until finally its time for dinner. It's a Diner Classic for a reason. It's fast. It's easy. It's tasty. A virtual trifecta of suburban cuisine. You've heard me talk about it before. Pancake Tuesday! The one day a year when it's okay to have pancakes for dinner without guilt. This year Pancake Tuesday happens to fall on swimming night. It seems to work out best to leave from the pool right from school. They have some tables set up where the canteen used to be. We'll sit and have a snack and the kids do some homework. We get back home where we have a quick dinner. Usually eggs. So the fact that Pancake Tuesday falls on swimming night is quite convenient. For the last little while I've been thinking about making Pumpkin Pie Pancakes. It happens that I have one bag of pumpkin puree in the left in the freezer. Using whole wheat flour, oatmeal and flax seeds should eliminate most of the guilt of this carbohydrate laden dinner. Making healthier pancakes, you can afford a little spiced whipped cream. I only wish I had so apple syrup left. When my parents lived in Ontario, the were close to an apple orchard which made the best apple syrup. Not that there is anything wrong with maple syrup. In a large bowl add dry ingredients. In another bowl, mix wet ingredients. Pour wet ingredients into dry ingredients and whisk together. In a skillet over medium heat, melt about 1 tbsp butter and coat the pan. Pour about 1/2 cup batter into skillet. Once bubbles come through the middle and edges no longer look fluid, flip the pancake to cook on the second side. Repeat until batter is gone. Serve with syrup, whipped cream and/ or icing sugar. Did you know you can freeze pancakes? 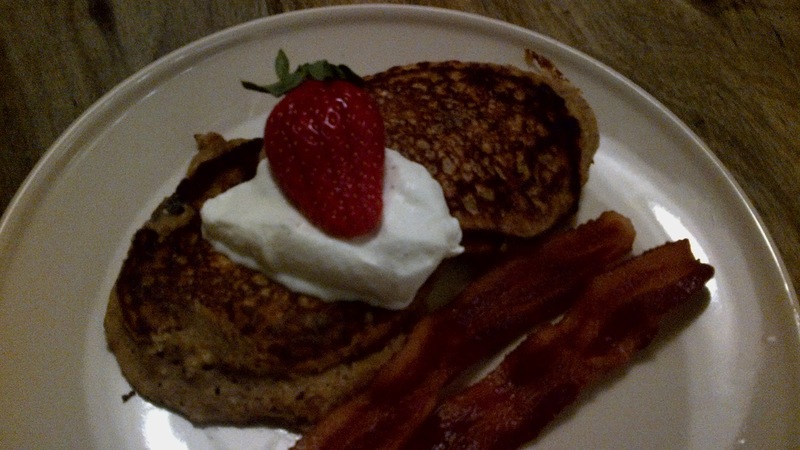 If you have leftover pancakes, place on a baking sheet lined with waxed or parchment paper. Place in the freezer for 30 minutes or so, and place them in a resealable freezer bag. Reheat in the microwave for a quick weekday breakfast.